The Secretary to the Ministry of Education has sacked several members from the Council of the National Institute of Education (NIE), allegedly upon orders from the Minister of Education. According to Nirmal Ranjith Dewasiri, along with him, Prof. Jayadeva Uyangoda, Prof. Senevi Epitawatte and Prof. Jayatillake have been sacked from the NIE Council. According to Devasiri, even though the NIE Council should meet once a month, no meetings have been convened since December 2015. “During the last meeting in December there was a serious dispute between us and the then Director General and the members also informed that they cannot work with the Director General,” Dewasiri, the former President of FUTA said. In May, Dewasiri and Uyangoda wrote to Prime Minister Ranil Wickremesinghe urging him to carry out a comprehensive institutional review of all aspects in connection to the NIE. In a letter addressed to Wickremesinghe, Members of the NIE Council, Jayadeva Uyangoda and Nirmal Ranjith Dewasiri, who are also senior professors of the University of Colombo also alleged that the management of the institute lacks the necessary capacity to fulfill it’s responsibilities. “To cite the personal experience of the two of us, we have at Council meetings repeatedly offered our voluntary service to help revive the research department of the NIE, and assist launching new capacity building programmes. We have also proposed that the NIE should begin to focus on the key functions of its mandate through research, policy dialogues and greater engagement with the Ministry and the government. The response we have received so far is to continuously ignore our requests,” they said in the letter dated May 2016. They noted that the NIE, which has been set up to function as the primary institutional link between the country’s school education and the government, with a farsighted mandate, is lacking in institutional, intellectual and managerial capacity as well as resources to fulfill its responsibilities. “We also recognize that the NIE should not be allowed to continue to decay. It is also our view that merely changing the DG or the Council can hardly revive the NIE. The revival and revitalization of the NIE calls for a major intervention by you as the Prime Minister and by the government led by you,” they stated. “As the first step in that direction, we would like to propose to you the need for a comprehensive institutional review of all aspects of the NIE. Such a review should include (a) updating of the need and relevance of the NIE to Sri Lanka today and tomorrow under the changing local and global conditions, (b) revisiting its existing mandate as laid down in the Act, (c) examining its functions, its organizational structure, managerial and administrative practices, (d) an assessment of its intellectual, research and other capacities, (e) human resource requirements, and (f) mapping out of its future directions. It is our view that the review committee should include (a) an international expert, preferably from UNESCO, conversant with the needs and nature of educational reforms in post-civil war and multi-ethnic societies, (b) Sri Lankan experts who have sensitivity to the challenges and role of school education in a multi-ethnic society in transition to peace and reconciliation after decades of civil war and violence,” the letter added. Honourable Ranil Wickremasinghe Esqr., M. P.
We, the undersigned, are members of the Council of National Institute of Education (NIE). While serving the NIE for a year in that capacity, we came to know somewhat closely about the serious crisis, which the NIE has been going through for several years. We consider it our duty to bring to your kind attention the dimensions of this crisis, which continue to persist unaddressed. We appreciate the active interest which you, in your capacity of the Honourable Prime Minister, have taken in the affairs of the NIE and your recent efforts to change its administrative leadership. The fact that the NIE was established on your initiative makes it all the more meaningful for you to intervene in reviving this crucial public institution which is the nerve center on matters relating to the entire school education sector of the country. At the same time, we feel that a major institutional overhaul and revitalization is necessary to enable the NIE to overcome its crisis, which has been built on over a period of many years of political control, politicization, mismanagement, malgovernance and bad administration, and lack of vision on the part of its leadership. As we have repeatedly observed, all of this have led to a condition of institutional decay of the NIE. Although the government change last year has produced a historic opportunity to arrest this process of NIE’s decay, we are sorry to say that this opportunity has not yet being seized, despite the earnest appeals to do so made by most of its council members, including the two of us. Le us brief you in summary some of the major shortcomings of the NIE. 1) NIE’s top leadership has lacked the vision to enable the NIE and its staff to fulfill its mandate. The NIE Act has given a broad and significant mandate to the NIE, primary among them being providing advise to the Honourable Minister of Education, and by implication to the government, “regarding plans, programmes and activities for the development of education in Sri Lanka (Clause 3 (a) of the NIE Act of 1985). We found no evidence to show that the NIE has been serving this vital component of its mandate. We brought this to the attention of the Acting Director General (DG) at a number of council meetings during 2015. However, he did not show any interest in this matter due, as we observed, to two main reasons. First, the Acting DG and the senior staff did not have an adequate understanding of the severity of the crisis of Sri Lanka’s school education sector. Second, the institutional, intellectual and professional capacity of the NIE to think critically and innovatively about matters relating to the country’s educational policy and directions have not been renewed or sustained. 2) One of the vital functions of the NIE is to prepare and revise from time to time the school syllabi and teachers’ guides. As members of the Council, we drew the attention of Acting DG to numerous mistakes, errors and inadequacies in many syllabi and teachers’ guides in the quality of content, philosophical and pedagogical orientation, language and proof-reading (including spelling and punctuation marks! ), and contemporary relevance. The NIE’s willingness to acknowledge and respond to our efforts has been slow and lukewarm. After our repeated requests, the Acting DG organized in November last year one workshop with the senior NIE staff, with the participation of members of the Council and the Academic Affairs Board, to explore the dimensions of the present crisis of school educational sector. Although a draft workshop report has been produced, no follow up action was taken to develop the report into a policy document to be shared with the Honourable Prime Minister and the Minister of Education. The reason perhaps is that the NIE’s senior officials are reluctant, if not afraid, to make policy inputs to the government, and they are quite confortable to function with a narrow and minimalist understanding of the NIE’s mandate. We also strongly feel that without making some significant revisions to the syllabi, teacher’s guides and eventually textbooks as well, the NIE cannot any longer serve the interests of Sri Lanka’s school education sector. We feel that the NIE leadership should be committed to improving the capacity of the institution to carry out this task. 3) The NIE leadership has so far failed to obtain the assistance and active participation of the Council or the Academic Affairs Board, both of which have members who are knowledgeable about the crisis of Sri Lanka’s educational sector, have ideas to respond to the crisis as well as suggestions for its constructive transformation, and have had engaged in shaping the public discourse on the country’s educational reform. They also posses the commitment to spare their expertise and energies to the public course of education. However, the NIE’s acting DG and the senior management have totally failed to harness this resource base for the benefit of the NIE. They expect the Council and the Academic Affairs Board to perform only their routine functions. To cite the personal experience of the two of us, we have at Council meetings repeatedly offered our voluntary service to help revive the research department of the NIE, and assist launching new capacity building programmes. We have also proposed that the NIE should begin to focus on the key functions of its mandate through research, policy dialogues and greater engagement with the Ministry and the government. The response we have received so far has been to continuously ignore our requests. 4) We have also observed that the NIE needs some serious governance reforms, with proper procedures in administration and management in place. We have found, and highlighted at Council meetings, serious inadequacies in, as well lack of attention to, financial accountability, proper procedures in examinations matters, and appointments as well as promotions of the staff. As far as we know, no adequate corrective measures have been taken to restore practices of good governance, transparent management, and efficient administration at the NIE. 5) As mentioned above, two very important functions of the NIE are preparing and updating/revising of school syllabi and the preparation and printing of teachers’ guides. With regard to these functions, we have observed the following serious shortcomings: (a) most of the syllabi and teachers’ guides – we are competent to comment only on material relating to non-science subjects – need fundamental revisions in order to update their objectives, orientations, content and outcomes; (b) most of the syllabi and teachers’ guides — particularly in the fields of social studies, political science, history, religious education, and literature – need their content adjusted to reflect the needs of the multi-ethnic and pluralistic character of Sri Lankan society; and (c) preparation, revision and updating of syllabi and teachers’ guides are controlled by groups within and outside the NIE with vested interests; they have successfully resisted any serious and innovative re-thinking; our observation is that these vital functions of the NIE are driven primarily by the limited perspectives and narrow agendas of these vested interests, some of which are located at the NIE itself. 6) There has not been a single Council meeting held since December 2015. The last Council meeting was abruptly adjourned when the most members of the Council as well as its Chairperson (Secretary to the Ministry of Education) refused to endorse retrospectively a procedurally wrong spending item and some irregular appointments and promotions made by the Acting DG. It is our considered view that the NIE, which has been set up to function as the primary institutional link between the country’s school education and the government, with a farsighted mandate, is lacking in institutional, intellectual and managerial capacity as well as resources to fulfill its responsibilities. We also recognize that the NIE should not be allowed to continue to decay. It is also our view that merely changing the DG or the Council can hardly revive the NIE. The revival and revitalization of the NIE calls for a major intervention by you as the Prime Minister and by the government led by you. As the first step in that direction, we would like to propose to you the need for a comprehensive institutional review of all aspects of the NIE. Such a review should include (a) updating of the need and relevance of the NIE to Sri Lanka today and tomorrow under the changing local and global conditions, (b) revisiting its existing mandate as laid down in the Act, (c) examining its functions, its organizational structure, managerial and administrative practices, (d) an assessment of its intellectual, research and other capacities, (e) human resource requirements, and (f) mapping out of its future directions. It is our view that the review committee should include (a) an international expert, preferably from UNESCO, conversant with the needs and nature of educational reforms in post-civil war and multi-ethnic societies, (b) Sri Lankan experts who have sensitivity to the challenges and role of school education in a multi-ethnic society in transition to peace and reconciliation after decades of civil war and violence. We sincerely hope that you will take the content of this letter into serious consideration and take immediate action to rescue from collapse a vital national institution, which you yourself had the far sight to establish nearly three decades ago. Jayadeva Uyangoda, Ph. 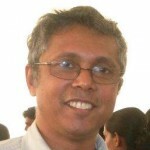 D. Senior Professor in Political Science, University of Colombo, and Member of the NIE Council. 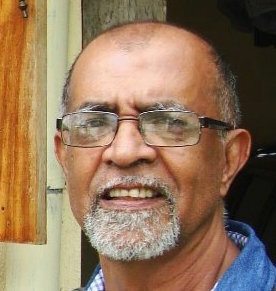 Nirmal Ranjith Devasiri, Ph. D. Senior Lecturer in History, University of Colombo, and Member of the NIE Council. Obviously these Professor dudes are not up to speed with the Uahapalana Education Policy. It was only a few weeks ago that Batalanada Ranil the PM told the media that, he is going to change our Schooling to US System, and give the students an American Education. Imagine our baiya boys and girls waving little American flags on Federal Holiday.. Seriously what input do these Arts Professors can contribute to leading edge American syllabus?. It won’t beat Sumanaya’s Rilapaka waving towards Mara fucker, though! I know you will be eating at least Roast Chicken from Keels, while waving the little US Flag , and wearing an Uncle Sam T shirt as well. Are you going to have Pirahaparan or Sambandan or Batalanada Ranil at the back of your Uncle Sam T Shirt?.. In my usual village terminology and the way my village people describe a situation like this is: “Apayata Hena Gahala Wagei” (-Lightning and Thunder have struck the Hell). Exactly! And Ranil has done just that by sacking this Nirmal lunatic! Was’nt this the same Nirmal lunatic that supported the regime change for the yahapalanya? Looks like another example of Ranil’s arrogance and ego problems when he refuses to look into the proposals by two of the Senior Professors with proven track records and orders them to be sacked instead! The man must be so intoxicated by the ‘power’ that has been reposed in him by the voters he lied to, that he must be under the mistaken impression that his tenure will last indefinitely (not unlike the previous bunch!). “Pride goeth before the fall”, Mr. PM, so watch out! my reading of the circumstances which led to the sack appears to be the letter sent by the two academics. i think it is harmless and only trying to sums up the prevailing condition of the NIE from the view point of them ; the best thing for the authorities is to take the points raised in the letter seriously since that is the only institution of that nature dealing with the education system in our country. any way there is a strange thing.. they say that the Council of the institution did not meet for a long time. is it correct? if it is correct what are the legal implications? if the NIE can function without council meetings then it appears that the council is redundant (?) or totally unnecessary. nie can function without a council? the academics appear to be ardent supporters of good governance and the present ‘governors.’they deserve more respect and consideration. hi academics,you have taken pains to suggest some wonderful steps to revive the N.INS of E but the only step taken was to sack you. Both duo work under the most corruptive regime in Cololmbo University. But did not made any noise and gave all coverups for all ills of this Arts faculty family dept and its VC dirt works. NIE, Sri Lanka has its own identity. It was established to perform similar roles of NCERT, India; NIE, Singapore; NIER, Japan etc. It should not be an institution that will function as a university. The decay (the word used in the letter) of NIE, Sri Lanka was due to the mismanagement of University professors. Former Director Generals Prof. Laxman Jayathilake, Prof. J.W. Wickramasinghe, Prof. W.M.Abeyratne Bandara (The last person did not know the difference between Syllabus, Teacher guide and Textbook too!) were responsible for the decay of NIE. They did not have an idea about school education and the role of NIE. They were acting based on the framework of Universities and specially political parties they blindly served as henchmen. Those professors who could not upgrade the Sri Lankan universities to a higher ranking level in the world ranking system came to devastate NIE. So better university professors can focus on their own universities and let NIE to develop based on the ideas of school education experts in Sri Lanka.